Bovada Casino is the biggest gambling portal that exclusively accepts players only from the United States. They were previously branded as Bodog. This casino is an easy choice here at BestRoulette.net, thanks to generous promotions and easy deposit options for US players as well as four two excellent Roulette games you can play for real money. There are more than 200 casino games to choose from and most of them are provided by the Real Time Gaming software. You will also find the latest mobile slots from the acclaimed BetSoft. You can download this casino onto your computer, or enjoy the instant-play (browser) version on a range of mobile and computer devices. Unique and often generous promotions have been the hallmark of this brand for more than a decade. These include plenty of reload bonuses, a comp point scheme and many one-offs and sometimes entertaining special offers. Read below to learn how you can take the advantage of this bonus. You’ll have a choice of the American Roulette and European Roulette wheels to play for real money. The difference between the games is the ‘double zero’ on the American version. This increases the house edge, so your default choice should always be European wheel. Bovada Online Casino offers two classic variations of the game also which comes with small changes such as graphics and betting options to make the roulette game more exciting for the online players. Since Real Time Gaming (RTG) is the leading casino software provider and Bovada being on the best online casinos their cooperation in providing online gambling experience to players around the world seems very natural. RTG provides the four excellent roulette playing options you can find below. Bovada Casino offers European roulette commonly referred as the single-zero roulette. The presence of single-zero on the roulette wheel is a key feature as it cuts down the house edge to 2.70% thus increasing your odds of winning. You should always pick the European variation of the roulette when playing for real money either it be in an online casino or at a land-based casino. European roulette consists of a wheel with 37 stops and a ball that can land with the equal chance on any one of them. The stops are numbered starting with 0, then 1-36, colored either black or red. Bet on where you think the ball will land by placing chips on the Roulette table. Remember: You should always play European version of roulette as it has the lowest house edge thus allowing you to play roulette much longer. Bovada has taken its standard European roulette and improved the graphics while adding few extra features in order to enhance player’s experience while playing roulette online for real money. European Roulette Classic comes with the same house edge as the standard single-zero roulette. Playing Bovada’s European Roulette Classic you will have the ability to not only place standard inside and outside bets but also racetrack bets. For more advanced players there are orphans, voisins du zéro, and tiers du cylindre betting options. For new players, we recommend taking a look at our comprehensive guide to various types of roulette bets. Bovada Casino offers also American roulette often referred as the double-zero roulette. The presence of double-zero on the roulette wheel is an important feature that you should avoid as it leads to the maximum house edge of 5.26% thus decreasing your odds of winning. You should try to avoid playing the American variation of roulette when playing for real money online casino or at a land-based casino. American Roulette consists of a wheel of 38 stops and a ball that can land with an equal chance on any of the 38 stops. The stops are numbered in a non-sequential order of 0, 00, and then 1-36. The stops 1-36 are colored either black or red while the 0 and 00 stops are colored green. You can make wagers on where the ball will land on the wheel by placing chips on the Roulette table. 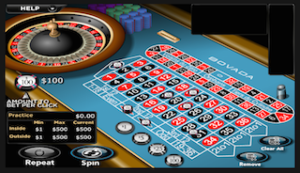 Bovada, just like with European roulette, has taken its standard American roulette and improved the graphics while adding few extra features in order to enhance player’s experience while playing roulette online for real money. American Roulette Classic comes with the same house edge as the standard double-zero roulette. Playing Bovada’s American Roulette Classic you will have the ability to place standard inside and outside bets, however, the racetrack bets, orphans, voisins du zéro, and tiers du cylindre bets are not available in this roulette variation. Players eager to play Bovada’s American Roulette Classic should familiarize themselves with the house edge for this particular game as it plays a key role in winning. Roulette games at Bovada Casino are easy to play. The wheel is a little small even on a large monitor though the ball’s final slot appears at the top right as soon as it stops. The betting grid is clear and clean and is presented at an angle so you won’t miss anything. What I like about this is that the 2 number and 4 number combinations are highlighted when you move your chips over the grid. This makes it easy to bet and stops you having to correct mistakes.The games are fast, you can re-bet the same pattern and see the results of the past spins too. A great all-around game though a slightly bigger wheel would make it even better. You can also play mobile roulette here via Bovada casino mobile. The European wheel is available as a responsive in-browser game which works fine on iPhone, or Android smartphone. As you might expect from the biggest US friendly online casino, the choice of games here is excellent. Table games include a choice of Blackjack games, several Casino Poker variations, Let It Ride and Craps. Slots are a strong area. 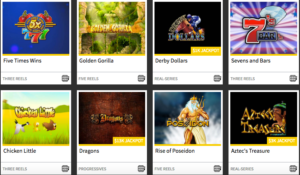 The latest titles from Real Time Gaming are all available and include both 3-reel and 5-reel slots. Check out the video slot titles from the ‘Real Series’ which not only include excellent free-spin rounds – but have randomly awarded progressive jackpots too. For an amazing slots experience, try the ‘3d slots’ section at this casino. Here you will find slots by BetSoft, which take these games to a whole new level. You’ll find animations and feature rounds which look more like animated movies than something you might associate with a slot. Rounding out the list of games you can find a great list of Video Poker titles, Sic-Bo, Keno (Bingo) and even Scratch-Cards. Bovada also has a poker room and one of the biggest offshore sportsbooks to keep you entertained. 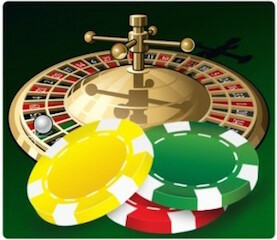 Before you can hit the excellent roulette games, you’ll need to make a deposit to your account to play for real money. With more than 10 years of experience, the customer service team at Bovada will always help you find a way to get your money on board. The first method to try is your credit card. Visa cards work best, often going straight through the first time. Alternatives include MasterCard – or you could buy a pre-paid Visa (speak to customer support to find out which brands are working before you buy one). You can also deposit using money transfer services, for example, Western Union. Withdrawing your profits is normally done via a paper check. This site will process one check for free each month, and charge an admin fee for further checks. You can also withdraw via the Western Union. 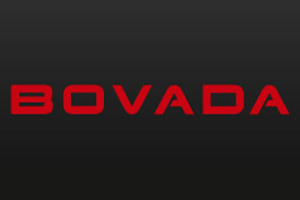 Bovada has grown to be the largest US gambling brand by looking after their players very well. There is a welcome bonus totaling $3000 to claim, split between a player’s first 3 deposits. It is a 100% up to $1,000 per deposit, giving you the total of $3,000 in free cash. To redeem this offer, use the bonus code: NEWWELCOME. Roulette play only counts 5% towards your play-through requirements of 25x. I recommend you claim your bonus and enjoy the wide range of games while you are meeting the requirements to clear it. The roulette games will be able to help you complete these offers, it will just take you longer. Fortunately, there are always promotions and special deals at this casino which do include roulette play. Comp points are awarded as you be and can be exchanged for chips. There are also daily offers, for example ‘table games Tuesdays’ which offer you incentives for playing different games. A special VIP section called the ‘Red Room’ which offers exclusive bonuses for high-stakes roulette players can also be found in its long list of offerings. Bovada does not offer live dealer casino experience thou it is the leading online casino in the US. The rumor is that it is working on creating a one of the kind of live casino experience which should be rolled out shortly according to the gambling industry insiders. Bovada makes a great choice for US roulette fans with four excellent games which are compatible with all your mobile and computer devices. This is a trusted and long-running brand that really does know how to keep their loyal players happy. My one reservation is that roulette games will not help to clear your welcome bonus package. Fortunately, there are plenty of extra promotions and bonuses available for when you complete the bonus play-through on other games. Bovada.lv casino is our top pick for US roulette players!! !